Leaving NZ didn’t turn out to be easy. Our first issue as we did our normal panic packing was a realisation that we had an extra bag. A full 23kg+ bag over our allowance, of which we were over weight already. How could we have miscounted?? We decided that there was nothing for it but to hit the airport and hope they didn’t cut up too much. It proved to be a minor issue. We paid $70NZ for the extra bag and weight – no problem at all. However, we immediately hit a bigger stumbling block. Because we had flown in to NZ SO long ago (November – really? 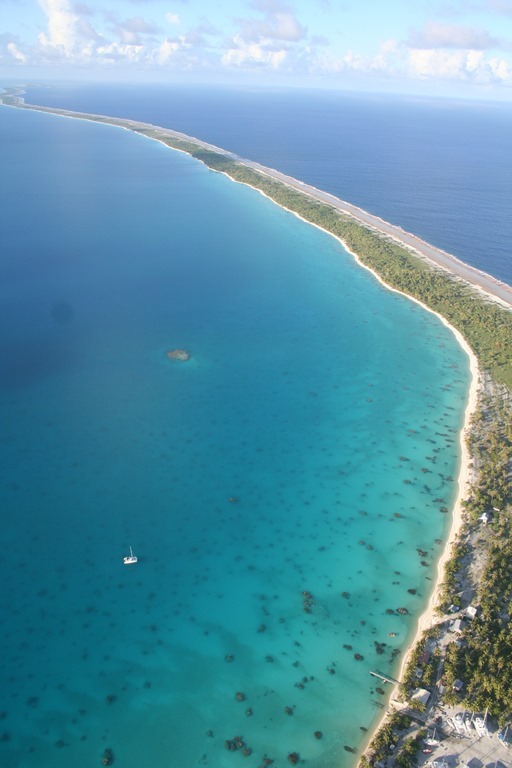 ), the airline wanted to know where our onward ticket was, a requirement of entry to French Polynesia. All our protests that we were European or simply on our return flight to our original location didn’t cut it with the lady behind the desk. “No, we didn’t have a letter from the yacht allowing us to join it. It is my boat and I am it’s Captain”. In the end, confused, she sent for the manager, who having asked us our tale, told the desk firmly they didn’t NEED to know about us and to book us on. After lots of Neanderthal looks from the desk at the manager, lots of ardent thank yous from us to the manager, we headed to departures. 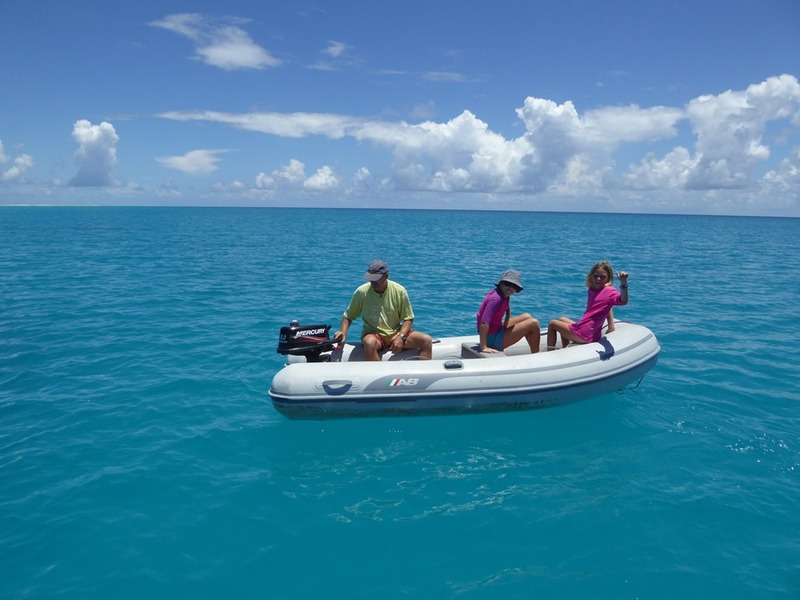 For those following on from us, be aware that FP is tightening up the regulations and even as a European, if you leave your boat in FP, you require a return ticket out off FP or a bond arranged with an agent in Tahiti for the airline to let you back in. Make sure you check the current regs before you travel. We got lucky with the manager who dealt with us. You might not be so. 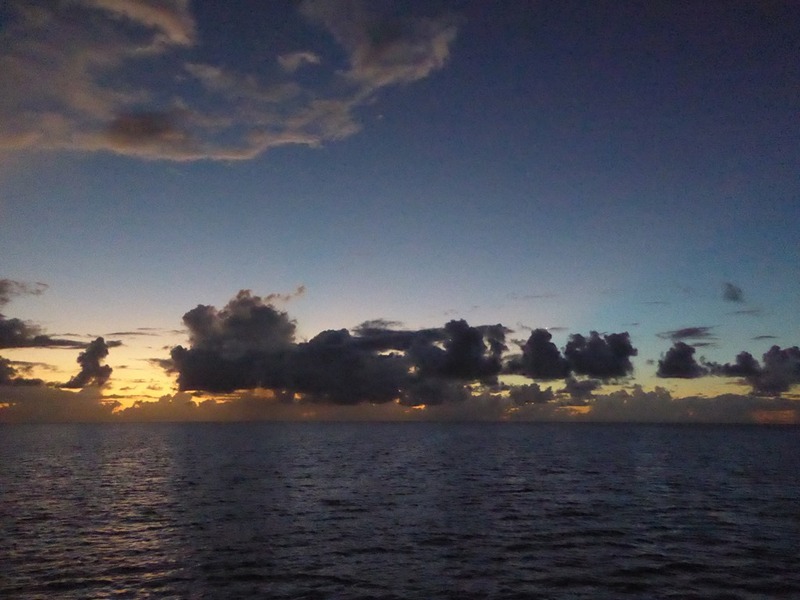 We had two nights in Papeete in a little flat, running around ordering bottom paint and a big food order to be delivered up by the supply ship, Cobia. We met up with John, Julia and Murphy of Mary Ann II and they were a massive help in showing us around. 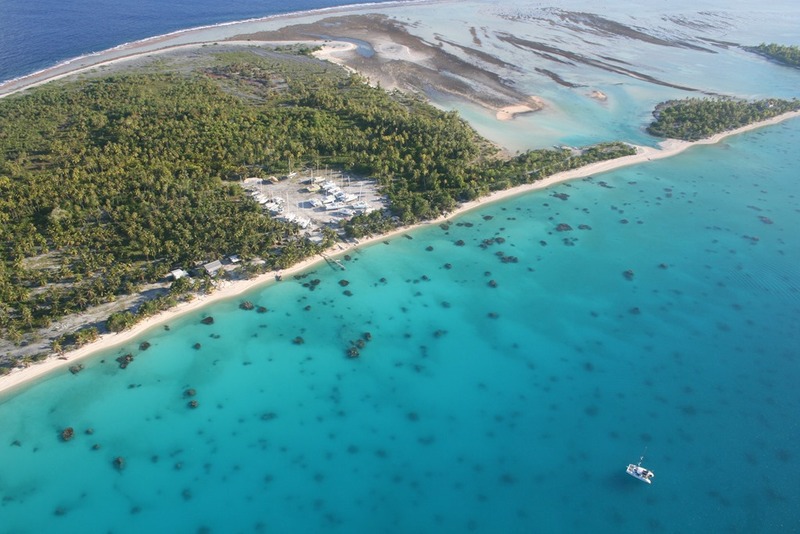 They had spent the summer in Marina Papeete in the middle of town and, having explored the town in detail, John had co-written a guide for yachties on where to find pretty much anything you needed. He was able to point me to a funny little machine shop by the dock which incidentally stocked Jotun and Hempel paints at commercial prices for the fishing fleet. Louis, the shop’s owner and a keen rugby fan, wanted two thirds of what the Apataki Caranage wanted for one I’d never heard of before, half the price of ABC3 (what I had on) and a third of the price of Micron 66, lovely paint but foully expensive. I ended up buying 20l of Hempel – a good German commercial brand. John’s investigative work saved me a fortune! His document is published in both Noonsite and the Soggy Paws’ blog site. In the same style as the Panama Guide, it is excellent and I strongly recommend it to you if you need to shop or stock up in Tahiti. I’m afraid we had less luck with Tahiti Sail, the one operating “sail maker” in Tahiti. We had asked them for a quote to look over and tart up the sails to get me down to Tahiti as I intended to order new sails to take us across to Aus. After advice and finding that such noted yachts as Lumiel, Mary Ann II and So What all had new sails done by Lee Sails, an outfit in Hong Kong, I went ahead and got quoted for a new main and genoa. 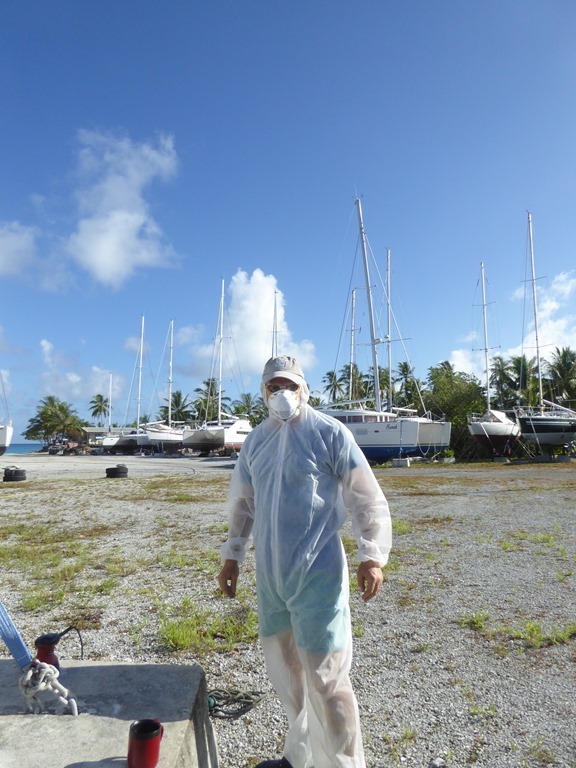 The repair quote I got back from Tahiti Sails for, frankly, not a lot of work was staggering and higher than the quote I got from Lee Sails for new. I even went back to them to ask if they were quoting for repair or new sails! On a whim, I asked them to quote for new sails too and was amazed to find that their price was more than double than Lee Sails – over 10k Euro. When asked why, they answered “quality cost” and that the sails would be coming all the way from UK! In the midst of this, I got an email from the one sail “expert” in the firm to say he had fallen out with the owner and he was leaving the business. I eventually allowed them to fix a small patch on the genoa only. 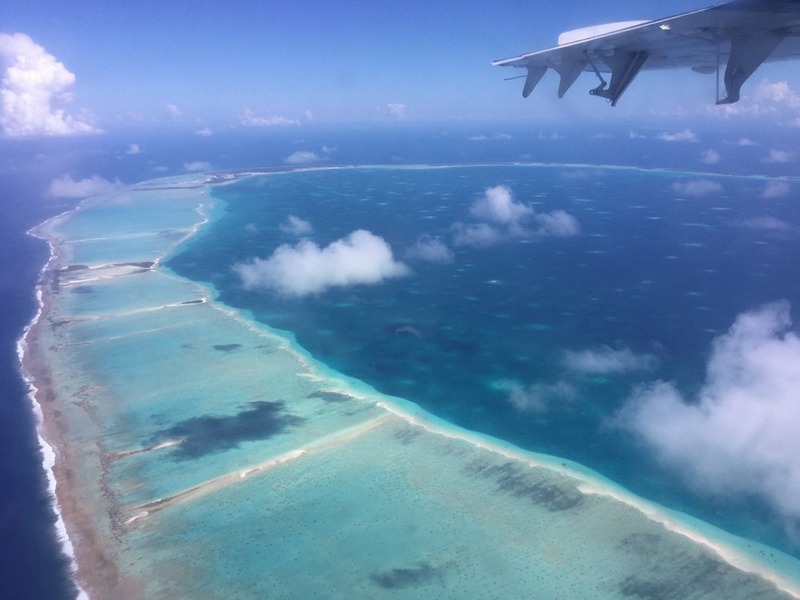 I know people believe that FP is at the end of the earth but importing goods is easy, there is a price point for value and Tahiti Sails has yet to meet it. I understand the owner (not a yachtie) believes he can squeeze the market as he has to date had the monopoly. My advice would be, unless you absolutely have to have work done by them, don’t. 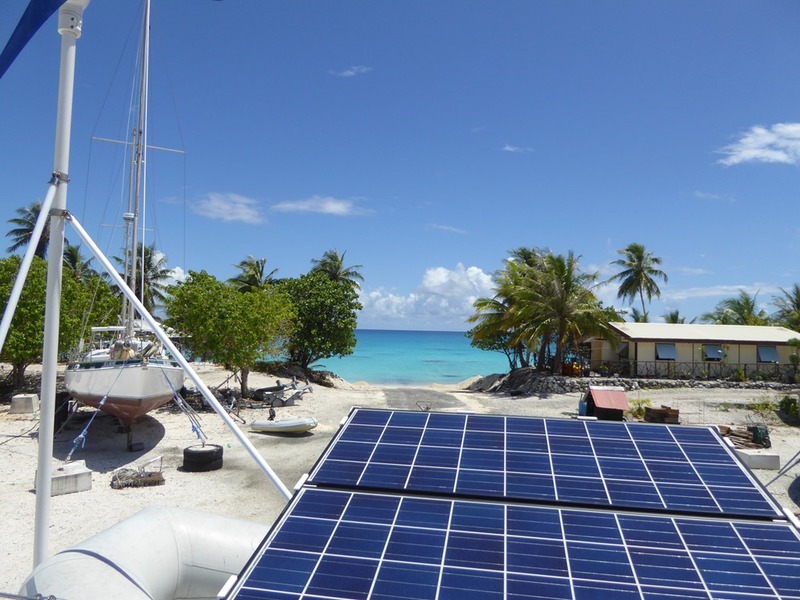 We have since found that two ladies, a yachtie and a local have just set up a small repair shop down near Marina Taina and they have been getting good reviews. 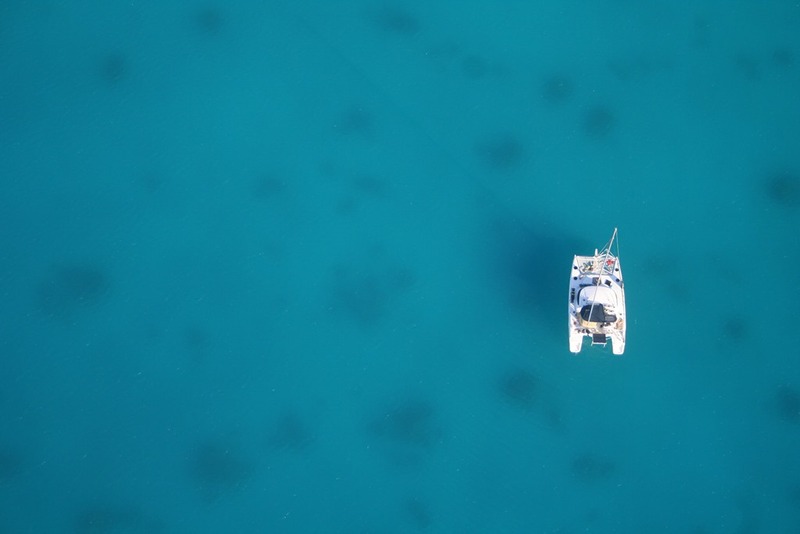 For new sails, look abroad yourself and simply appoint an agent to get your tax free goods in. It isn’t difficult. 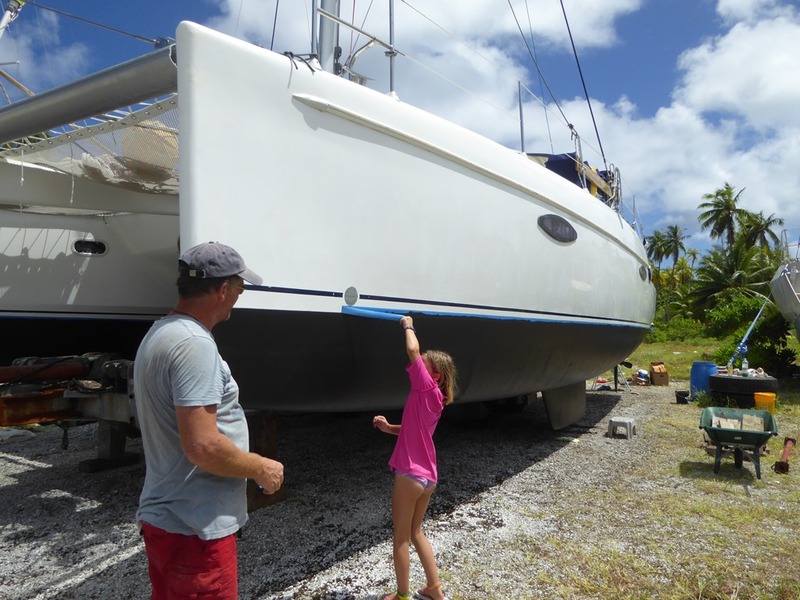 Whilst dawdling with Mary Ann II in Marina Papeete, we also met up with a couple of kids boats, Be and Be, an Aus boat with four kids and Sangvind with two boys. We had a good night out together, eating down on the waterfront in the street stalls, the kids skateboarding in the park and having deep and meaningful conversations out of earshot of the parents! We are hoping to be able to catch up with both boats a little down island. Good people. We flew back up to Apataki to find the yard had been battered by a storm a couple of weeks previously with winds hitting 85kts. The phone lines were down, the jetty and workshop was gone and it had taken two days to dig the slip and launch channel out. Thankfully all the houses had survived, as had all the boats in the yard. Skylark, other than a small infestation of ants, a common problem in the yard, was in good nick. But it was so hot! With the yard sheltered from the slight breeze there was, daytime temperature hit 40+C inside and the night time was only a few degrees cooler. We left the tinfoil over the windows to keep some of the heat out and it helped a little. 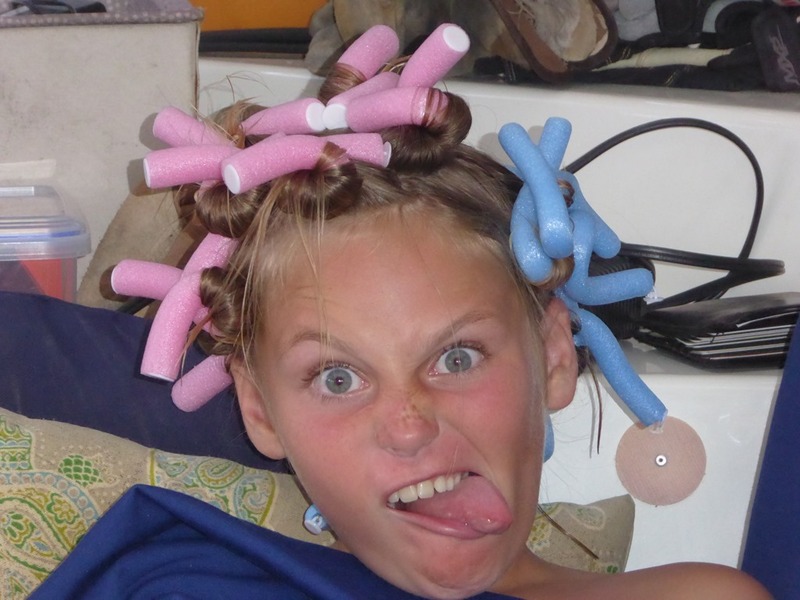 With time to kill, the girls decided to have fun with their hair again. Frizzy is in! I helped Alfred, the yard’s owner, fix the swing and the girls had a great time twisting it up and trying to make themselves sick. I took to getting up before dawn as the only time the heat was bearable when working on Skylark was before 0900hrs. 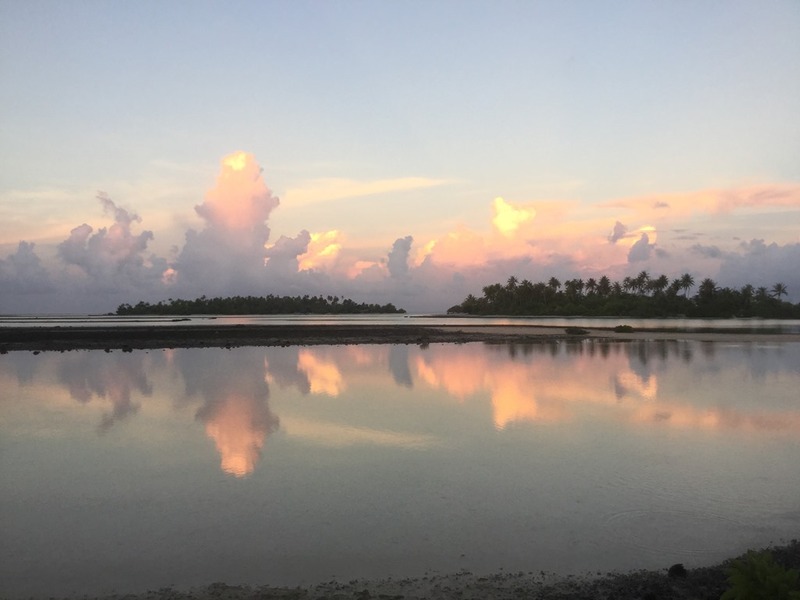 There were days enough to waste some time wandering across the atoll to see a few dawns as well. 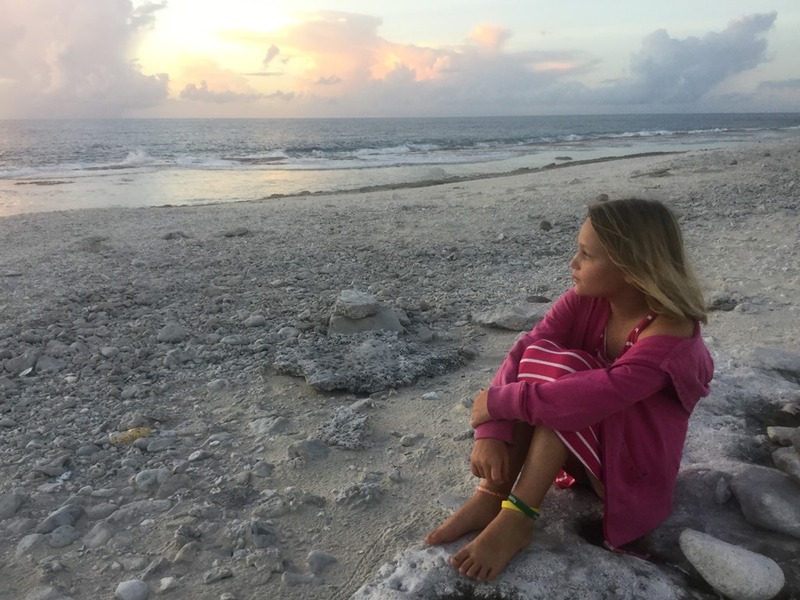 Hannah decided she wanted come one morning and we were blessed by a beautiful sky. With the heat and with lots of mosquitos about, our first few days back are easily described as very unpleasant. We got more bad news when we heard that the Cobia wasn’t to deliver to Apataki for another week, potentially meaning extra and unwanted time frying on the hard. We asked why she wasn’t running to Apataki and simply got a shrug. Presumably not enough business. With our sails, paint and food all due on her, we were unhappy that our timetable had been knocked back by at least a week. 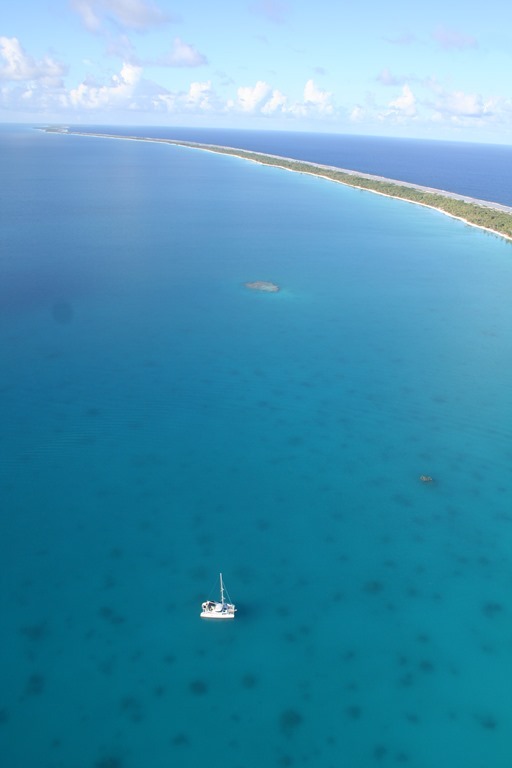 Frantic calls by Skype (and a lot of help by John and Julia at the Papeete end) meant we were able to rearrange delivery on another ship to Arutua, an atoll some 40 miles W of Apataki. It cost us $100US in fuel costs to pick our stuff up but it meant we could eat something other than eggs and start painting. In the meantime, we polished the hull, changed the anodes, did the small bits and pieces we needed to do get her re-commissioned inside and out. We sanded Skylark down. Wearing the painting zoot suits was an exercise in torture but on the bright side, it was a great way to sweat the weight of NZ overindulgence off! 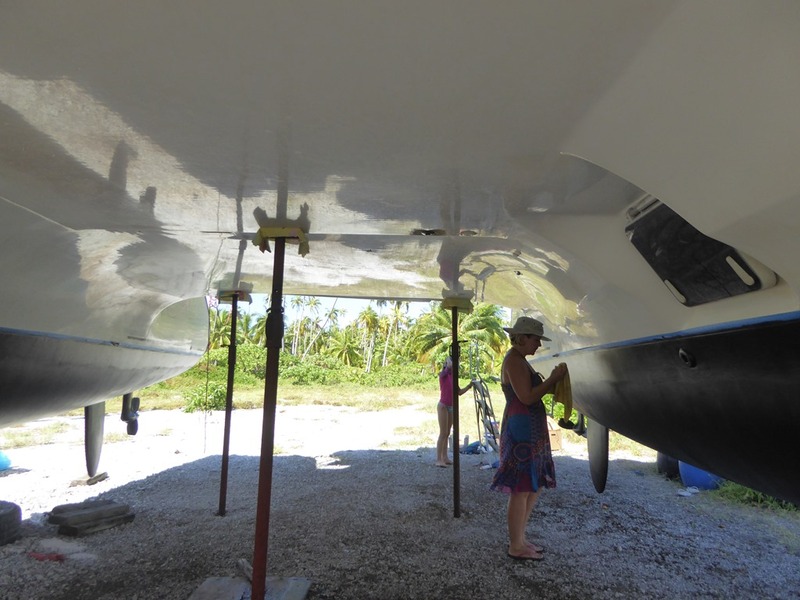 The girls, desperate to help, got in on the act and helped with the sail drives and props with their separate non-copper epoxy paint job and touching up with barrier paint where required whilst we waited for the hull paint to arrive. Once that appeared they got in the act again. The large size suits were hilariously massive on them and they couldn’t last long in the heat but they were a big help throughout. 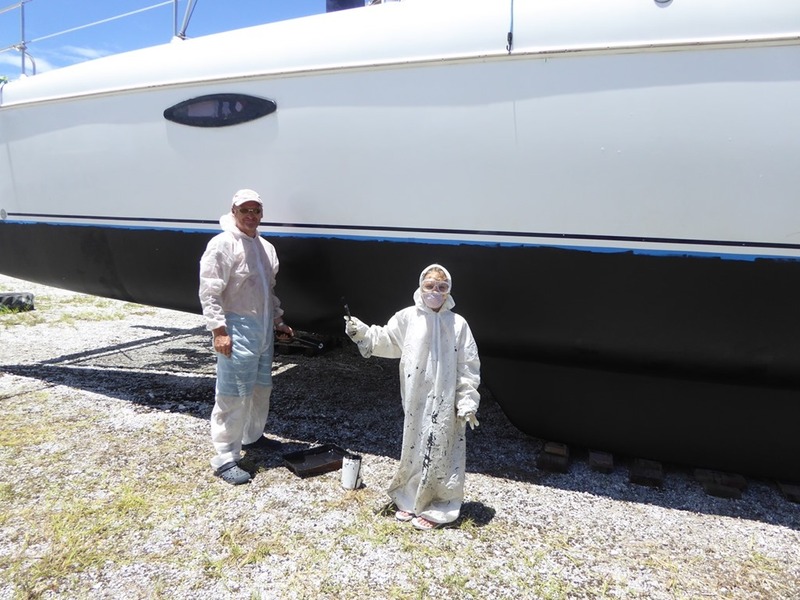 In the end, we had enough paint (and time) for three coats for the hulls and four for the edges and waterline. It was a sweaty exercise but there is something very satisfying about seeing your yacht turn into a swan again. Compared to the coats of red and blue paint she has been dressed in before, we think she looks best in black. We launched without incident and were so glad to be back at anchor and into a breeze again. We had a few days to wait for our sails but life had started to look up again. We swam, snorkelled and explored the water around us, just chilling. One of the yachts in the yard was owned by a Frenchman, Léon Philibien. Léon is a professional photographer and he travels everywhere with his paraglider, which he take most of his shots from. He took some wonderful ones of the yard, atoll and of Skylark for which we are very grateful for the use of. 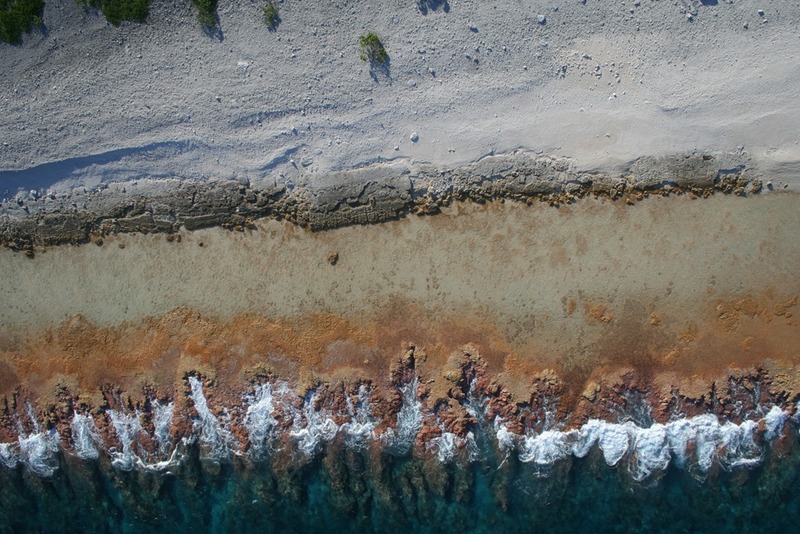 I doubt if many yachts have their own aerial shots set in the Tuamotus! 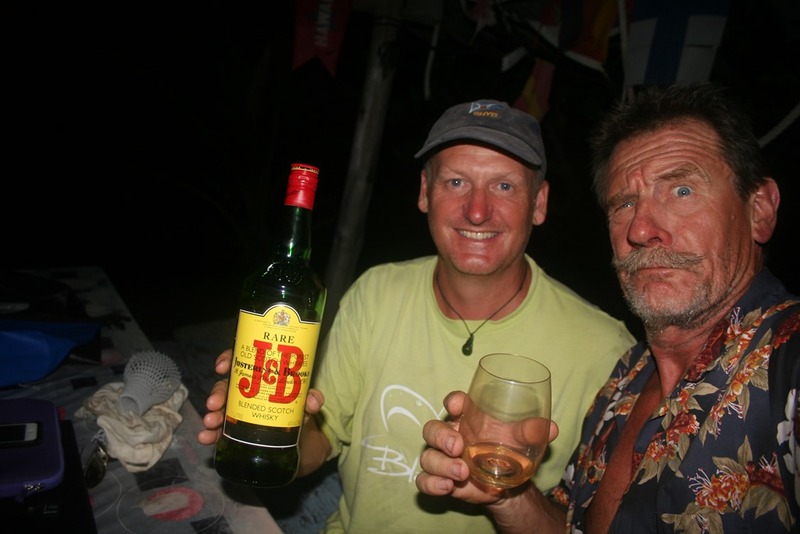 We are hoping that we meet him down island when we can repay his kindness again with his favourite tipple – whisky! His blog is pretty impressive – lesadventuresdelamatine.blogspot.fr . The five photos below are his copyright. 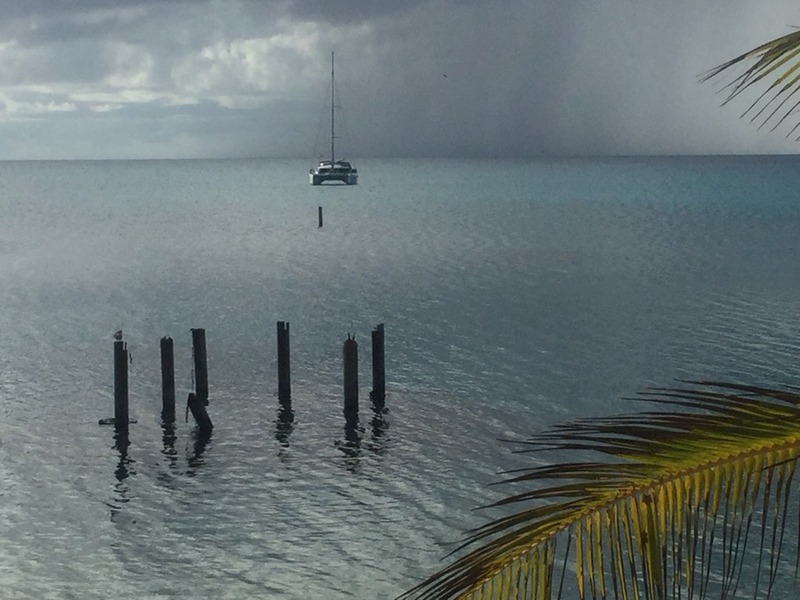 Our sails arrived on the Cobia (Tahiti Sails missing delivery by a week) and we had the engine on and the anchor up before we even had them hanked back on. We had had enough of Apataki, not its fault, just too much heat and a degree of frustration meant we needed to get going. Our first sunset on the move again on 2017 was beautiful. 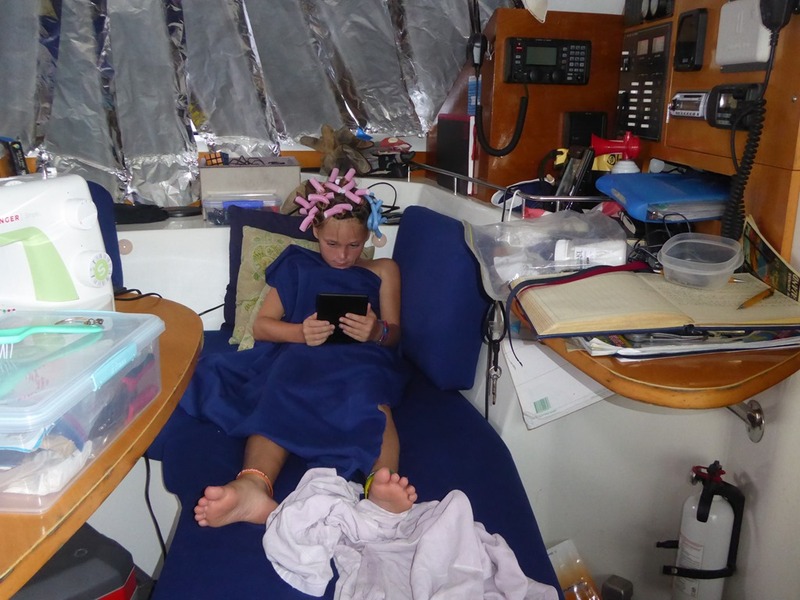 We ran out the N pass with no wind, engines on and a 60 mile overnight passage ahead to get to Rangiroa.